Eggplant bharta - Baigan bharta(hindi) is vangyache bharit in Marathi. 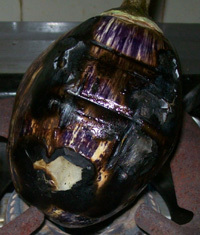 It is made from roasted eggplant (also called as brinjal, baigan(hindi), vangi(marathi), badanekai(kannada). I like eggplants / brinjals but I do not like to eat eggplant skins. I like this way of cooking eggplant because I do not have to eat the skins. If you are like me, this is a perfect recipe for people like us. This is a easy eggplant recipe and it is served with breads like chapati, roti, nan, bhakri (jowar or bajra roti). It also goes very well with plain steamed rice. Go to North Indian Baigan ka Bharta if you are looking for that recipe. You will find two Baigan ka bharta recipes. 1. Baigan bharta with curd(yogurt) - scroll to find below. Find here how to roast eggplant on the stove top. 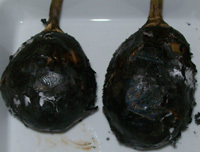 After the eggplant is roasted, remove carefully the blackened skin from the roasted eggplant and mash the flesh with a potato masher or with a fork. Use this mashed eggplant for making the baigan bharta. Garlic(optional) - 1/2 tsp paste or chopped finely. Fresh coriander leaves - 1 tbsp chopped finely. Mix all the bharta ingredients in a bowl. Prepare tempering using the ingredients given above and the method below. When they stop spluttering, add split green chili, fry for a few seconds. Add hing, curry leaves. Take off fire. Add to the mashed eggplant mixture and mix well. Serve with chapatti or bhakri (jowar / sorghum flat bread). This is served at room temperature. Add more fresh curd if you like. You can also add dry red chilies instead of green chili. You can use dried stuffed chili - methi mirchi (fry them in oil), in this bharta. Add the fresh curd about 15-30 minutes before serving. You can store this bharta in the fridge without adding curd. It will keep for 2-3 days. Just add curd before serving. Roasted - Mashed Eggplant - Roasted eggplant bharta, maharashtrian style.